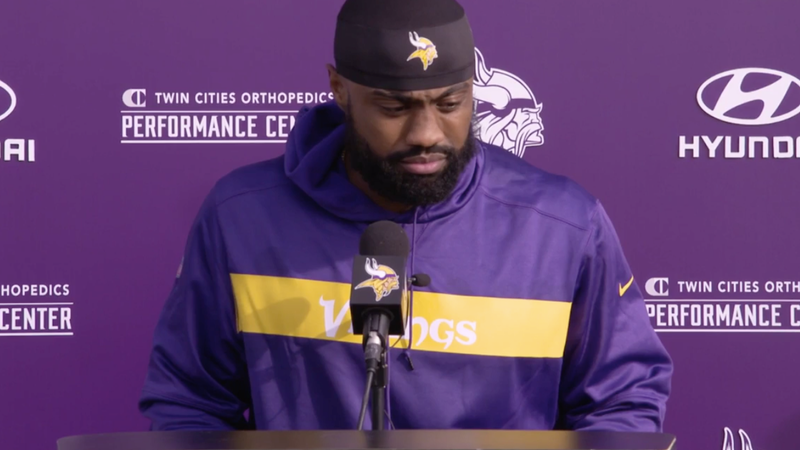 Everson Griffen Back With The Vikings After Mental Health Evaluation: "I'm Taking It One Day At A Time"
Five weeks after Minnesota Vikings defensive lineman Everson Griffen jumped out of an ambulance on the way to a mental-health evaluation following weeks of erratic behavior that included threatening to shoot someone at a hotel in Minneapolis, he is back with the team, and addressed reporters after practice on Wednesday. Griffen said he is excited to be back with the team but emphasized repeatedly that his recovery is a process. Griffen wasn’t ready to answer a question about what he did in the weeks away from the team. “I’m not comfortable answering that question right now but in the future I will be able to,” he said, also declining to specify what led to the September incident. Griffen talked about finding a balance between football and his life, family and kids, and advised anyone else who is struggling to “put your pride aside” and ask for help. Griffen said he feels good physically, but acknowledged he is still knocking the rust off after not having played for five weeks. When asked if he would play Sunday against the Saints, he said it was up to Vikings coach Mike Zimmer.